This program can be used by every organization to register visitors' recording. Our software makes it easier to keep track of when and who gets a visit. The program has a special visit log that can be easily used for recording who comes, who has a visit reservation and a purpose of visit. You can also add more information about a visitor, for example, entrance fee or number of pass. 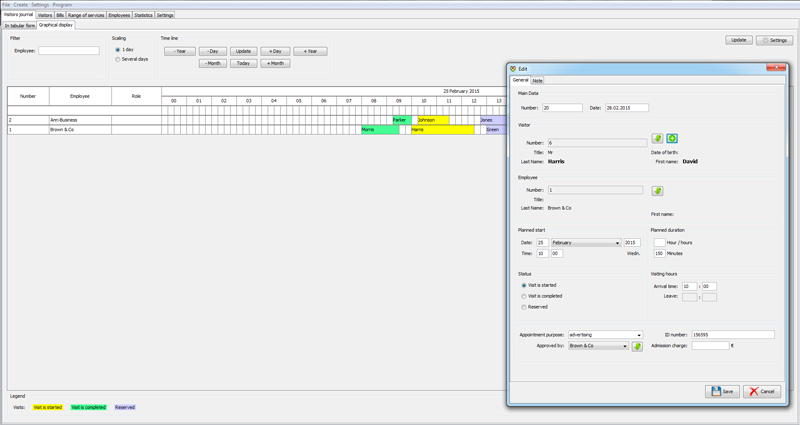 If necessary, such a visit log can be printed in the required format - CSV or PDF. Every entry may have a status, like: reserved, visit started / completed. Depending on the needs of a firm, your own filters with necessary parameters can be set in the visit log, such as, status, date, visitor, etc. Practical maintenance client base. The program makes it easy to maintain a database of visitors. If the visit is already not for the first time, the visitor can be selected from the program list. Each card visitor has many fields that provide further data on the person, which it describes. Among such information, you can find personal information, contact details and so on. It is very convenient that a visitor card has a list of all his visits, as well as their purpose. The program gives an opportunity to provide all visitors with different services, and issue invoices. Invoices can be printed (if necessary) in PDF-format. For statistical purposes, the program provides special and convenient features. So, you can easily view who and how many visits has. Easy start. You don�t need to worry about getting learning the program. In fact, it is very simple and accessible. Thus, so-called quick buttons are even provided in the software. An import of a list of employees is also exists in our product. Every list of the program can be exported or printed, which further simplifies the workflow. Optionally, you can backup the program data, and other operations, that make the work easier and more interesting.